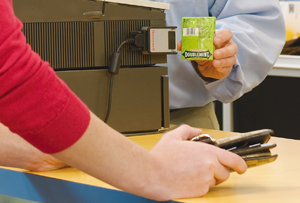 Honeywell's presentation scanner segment comprises compact devices for the checkout as well as reliable document scanning. The small-sized 1D and 2D scanners fit into crowded checkouts and often offer fix-mounting options for stationary applications. Other models feature designs that are suitable for either stationary or handheld operation, if the need arises. Users thus react to changing requirements in everyday business in a flexible manner. EAS decoding functionality is another practical feature that allows users to deactivate anti-theft tags; this is even a standard feature in some models.